Port Huron Michigan is a major port along the Great Lakes system. The city has been an important part of the American automobile industry for decades. But, it is much more than that. Its history streches as far back as the late 1600's with the establishment of Fort St. Joseph. Port Huron has always been intimately connected with the river traffic between Lake Huron and Lake Erie. In recent years, the community has invested heavily in its waterfront and today, it is an appealing stopover port for cruising sailors. Proceed upstream until you reach the mouth of the Black River, on your Port. The entrance is marked with a FL GREEN light - "1". Another visual marker is the permanently-raised C&O RR bridge immediately inside the entrance on the north side of the river. The entrance to the St Clair River is marked with Q GREEN "G1" and a Q RED "R2" buoys. Upon entering the river channel, follow it South approximately 2 nm to the mouth of the Black River, on your starboard side. The entrance is marked with a FL GREEN light - "1". Another visual marker is the permanently-raised C&O RR bridge immediately inside the entrance on the north side of the river. There are four facilities to consider as you proceed up the Black River. Desmund Marine is the first marina inside the river located on the south shore. There are transient slips available. There is a fuel dock (diesel and gasoline). There is water and power available dockside. Repair and maintenance services can be arranged. There is a haul out facility. Internet access is available. PHYC is located immediately inside the entrance to the Black River on the north shore. PHYC has several slips available for transient sailors. However, there are some restrictions. There is no fuel dock. Power and water are available but water is limited. Rest rooms and showers are available as is internet access. River Street Marina is located on the south side of the river approximately 1.7 nm upstream. It is operated by the city of Port Huron. It has 95 slips with 60 available to transient sailors on a 'first come - first served' basis. There is a fuel dock (diesel and gasoline) and pumpout station. Power, water and television hook-ups are available dockside. There are restrooms, showers and laundry facilities available. There is internet access. The marina is located only 1-2 blocks from the downtown, making shopping (and spending) easy! Bridge Harbor Marina is about .1 nm further upstream from the River Street Marnina, on the south side. It has approximately 50 slips available for transient sailors. There is no fuel dock. There is water, power and television available dockside. The is also an individual pumpout facility available at each slip. There are restrooms, showers and laundry facilities available in their clubhouse. Amenities include a heated swimming pool, library, playing courts, picnic and BBQ areas. Internet access is available as well. Desmond Marine can arrange to have repairs and maintenance services brought in. GL Marine Outfitters is a chandlery with a good selection of equipment. There are no grocery stores close to the waterfront. However, beyond the waterfront, there are several large supermarkets south of the downtown. You would need a taxi. There are several banks and ATM's within walking distance of the waterfront. Port Huron Hospital (810) 487-5000 is located about 1 mi/2 km north of the river. St, Joseph Mercy Hospital (810) 985-1500 is located about 2 mi/3 km south of the river. ThumbCoast Brewing Company is a neat brew pub/micro brewery. Under new ownership, they are located only the river on the North side. They have two dining rooms - 1 downstairs and a 2nd, lovely, airy dining room upstairs. They also have a great, multi-level patio/deck along the river - which I have enjoyed on a warm summer's afternoon. They carry a good selection of quality craft beers, including their own. They also have an 80ft / 25m wall where guests can tie up - heck, they will even serve you at your vessel! Lynch's Irish Tavern is close to the riveron the north side. It offters traditional pub fare in a casual environment. Doubletree Inn is located virtually under the Bluewater International Bridge between the United States and Canada. Freighters Lounge is more relaxed venue with an outdoor patio and a good view of river traffic passing by. The Vintage Tavern is located downtown. Its menu is a mix of steaks, seafood and pasta with quite a wine list to match. It has an outstanding rooftop deck. Downtown Port Huron has a number of shopping opportunities in a relatively compact area. There are some large malls north of the downtown. You would need a taxi to get to them. Vantage Point is the home of the Great Lakes Maritime Centre. 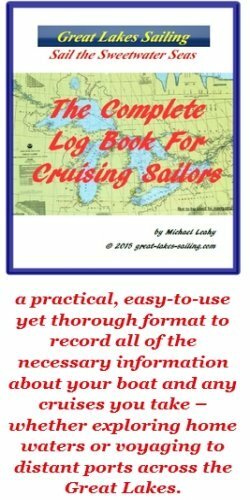 This is a terrific place to learn about the commercial shipping on the Great Lakes as well as enjoy the panoramic view of the river and freighters slipping right past in front of you. There are some lovely beaches along the Lake Huron shoreline to enjoy. There are a number of museums including the Lake Huron Lightship which is now a US Coast Guard museum and the Thomas Edison Museum which highlights work done by the inventor who lived here in his early years. Mid-July sees the Bluewater Fest - 4 days of music, food and fun. This happens in conjunction with the Bayview Port Huron to Mackinac Sailboat Race. Nearly a century old, this is reputedly the largest freshwater sailing race in the world. Dock space during this event is at a premium. Advance registration for a slip is possible months ahead at the River Street Marina. A quick look at this Port Huron Michigan tourism site will give you many ideas on getting the most of your visit.